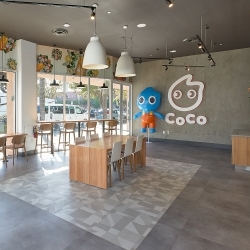 CoCo Fresh Tea & Juice, a Taiwanese company, opens their newest United States location in Fisherman's Wharf, San Francisco with the architectural team at TECTA Associates. San Francisco, CA, September 15, 2018 --(PR.com)-- Taiwanese company, CoCo Fresh Tea & Juice, announced that they will be hosting their grand opening for their newest United States location in Fisherman’s Wharf, San Francisco on September 15, 2018 at 10:30AM. Their newest location is located at 2699 Taylor Street, San Francisco, CA 94133 at the Corner of Beach St and Taylor St.
CoCo Fresh Tea & Juice’s newest location was designed by the architectural team at TECTA Associates, an experienced architectural firm specializing in restaurant and food service located in Mission District of San Francisco. The team was led by Principal Ahmad Mohazab, Design Manager Alina Cherny, Project Manager Shaun Tides and Project Coordinator Andrè Wainwright. The facilities feature convenient access from the street, tables and seating for up to 30 people as well as a single counter for ordering, as well as picking up food and beverages. The interior features modern and sustainable design elements including tile and concrete floors, LED lighting and wood tables. The space contains a Neolith wall with the Coco Fresh Tea & Juice logo, which serves as the focal point of the space. The Neolith wall consists of 5’ x 10’ tile panels.